The U3011 has superb viewing angles, just like we've grown accustomed to seeing from IPS panels. Even at the far extreme horizontally, there's none of the purple I'm used to seeing from TN panels as you move off-axis. In the vertical direction, I saw the same thing with almost nothing to complain about. I did notice some glare at the extreme angles, but again that's dependent on where you're sitting and where light sources are located. I think this is an excellent opportunity to talk about IPS graininess, something we really haven't discussed before. Of the IPS panels I've used to date, all of them have had some high frequency grain on the surface from a combination of coating and interference at the interface. Thankfully the U3011 has a combination antireflection coating and hard coating, and subjectively there seems to be less grain than I've seen on other displays. Next up are the ever-important color quality metrics. 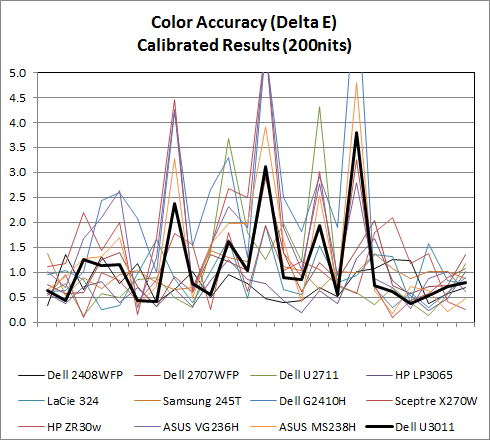 As usual, we report two main quality metrics: color accuracy (Delta-E) and color gamut. Color gamut refers to the range of colors the display is able to represent with respect to some color space. In this case, our reference is the AdobeRGB 1998 color space, which is larger than the sRGB color space. Our percentages are thus reported with respect to AdobeRGB 1998, and larger is generally better unless you're dealing with sRGB content and colorspace-unaware software. 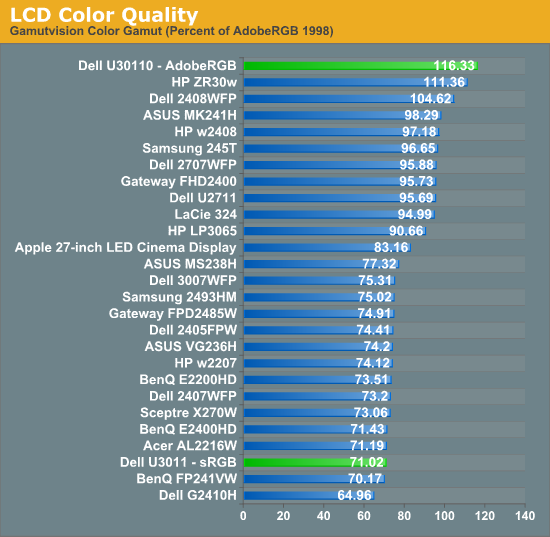 Color accuracy (Delta E) refers to the display’s ability to display the correct color requested by the GPU and OS. The difference between the color represented by the display, and the color requested by the GPU is our Delta-E, and lower is better here. In practice, a Delta E under 1.0 is perfect - the chromatic sensitivity of the human eye is not great enough to distinguish a difference. Moving up, a Delta E of 2.0 or less is generally considered fit for use in a professional imaging environment - it isn’t perfect, but it’s hard to gauge the difference. Finally, Delta E of 4.0 and above is considered visible with the human eye. Of course, the big consideration here is frame of reference; unless you have another monitor or some print samples like a Gretag Macbeth color checker card to compare your display with, you might not notice. As I mentioned in our earlier reviews, we’ve updated our display test bench. 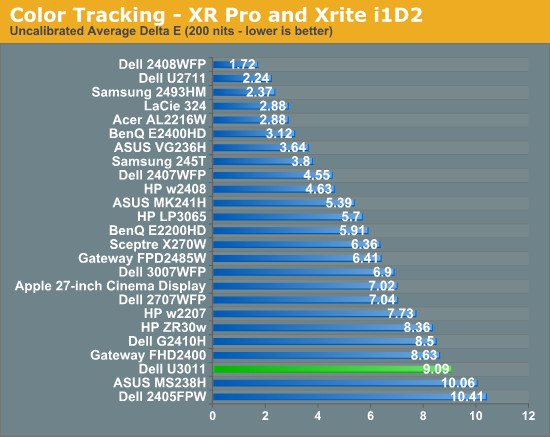 We’ve deprecated the Monaco Optix XR Pro colorimeter in favor of an Xrite i1D2 since there are no longer up-to-date drivers for modern platforms. We're trying to find an i1Pro to use as well. For these tests, we calibrate the display and try to obtain the best Delta-E we can get at both 200 nits of brightness for normal use, and 100 nits for print brightness. We target D65 and a gamma of 2.2, but sometimes the best performance lies at native temperature and another gamma, so we try to find what absolute absolute best-case performance for each display. We also take an uncalibrated measurement to show performance out of the box using either the manufacturer supplied color profile, or a generic one with no LUT data. For all of these, dynamic contrast is disabled, and displays are left to settle for a half hour after making changes. The U3011 is CCFL-backlit, and I used a settle time of 30 minutes accordingly. First up is uncalibrated Delta-E performance. For this test, I took the monitor out of the box, connected it over DisplayPort, adjusted to 200 nits, and ran our usual GMB color checker test. Results aren't that great, sadly. 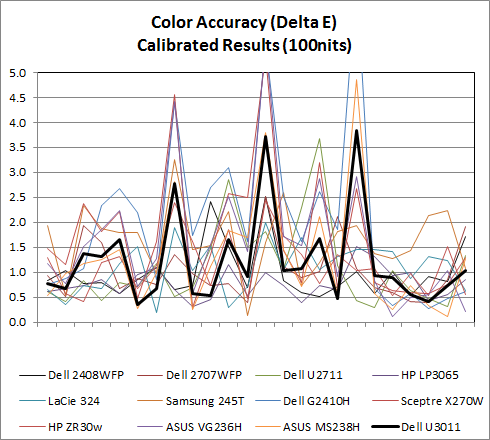 I mentioned earlier that the U3011 we got from Dell for testing came with no factory calibration report. After checking up with them, we learned this is a pre-production unit identical to what's shipping now, minus that factory calibration. That's something we can live with, especially since we recommend every display be calibrated, but still unnerving. 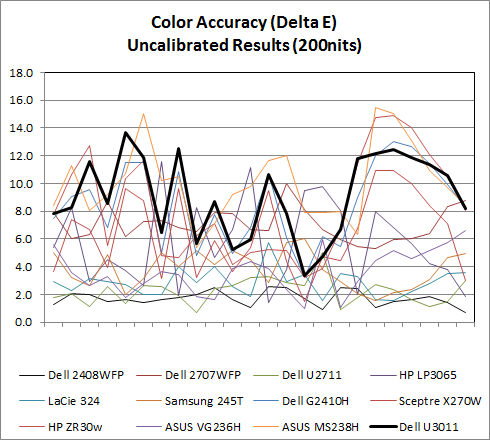 Calibrated Delta-E is very good, though I'm still surprised the U3011 can't get under 1.0 on our tests. 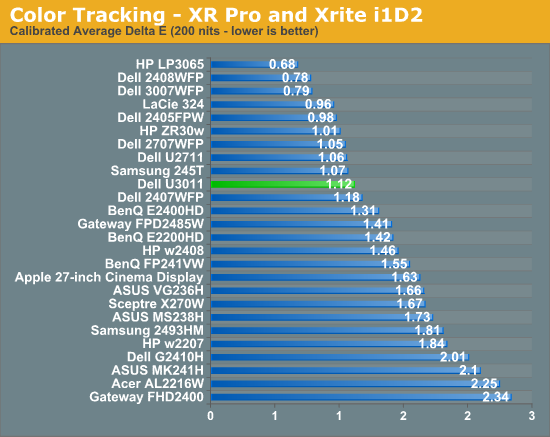 I'm starting to suspect that our i1D2 isn't quite as good as the Monaco Optix XR Pro, and have started looking for an i1Pro spectroradiometer as a result so we can have something more accurate going forward. That said, performance is still more than adequate for professional work. These two calibrations were performed in the sRGB mode at D65. In addition, the U3011 has modes for AdobeRGB color space and sRGB in the OSD, something extremely useful for doing work and not getting oversaturation in applications that lack color management. You can immediately see the effect of those two modes in the color gamut measure above. Letting the monitor free to use its entire gamut of color, it leads the pack. Turn sRGB mode on, and it clamps down just nicely. 116.33% is also shockingly close to Dell's advertised 117% coverage of CIE 1796 (AdobeRGB), which is awesome to see confirmed above. I'd like to know this as well but dont think that monitor was ever reviewed on here. Weird considering how popular it was. I have the 3008WFP and also the HP ZR30w thats been reviewed on here before and also mentioned in this article. 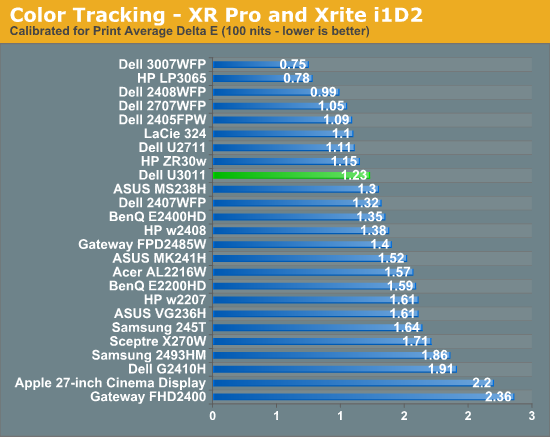 They say the HP's colours are slighter better than the new Dells when calibrated, well theres not even much difference between my HP ZR30w and my older Dell 3008... but it is better (i have them both colour calibrated too). And the HP also has more uniform backlighting with less bleed, and theres no noticeable lag. I've got a 3008WFP too and I agree that the res/input switching lag is rather high on it. It's quite annoying because it takes a lot of time for the display to come out of sleep. The OSD also seems much improved on the 3011. However, I haven't noticed input lag on my A02 revision. I have a Sony HDTV that according to hdtvtest.co.uk has 0-10 ms input lag and running both displays in clone mode I saw no real difference between them. I have an A02 revision too. The only way to really see lag is to have another display right next to the 3008 thats the same size/res, then have an extended desktop spanning across both displays, and drag a window down the middle, so half of the window is on the 3008, and the other half on the other display. Even then you can only just see it. Colour with games isn't a problem much on the HP, it's default colours are pretty good, just a little cold. They're much better than 3008's factory default, and it's harder to notice with games compared to the desktop anyway. How would you subjectively compare the U3011 and the U2711? I am personally on the fence, debating whether the price difference is worth the 3 inches. For me, I would use it primarily for general office use, followed by Photoshop/digital photography, and then gaming last. I think quality wise both are pretty close, and I've seen the U2711 for extremely cheap on slickdeals and other places occasionally. Granted, I did see the U3011 for $1045 last week as well, so it's one of those things that's entirely luck-bound. Honestly I'm a bit partial to the U2711 because of it's lower pixel pitch/higher PPI (I'm a fan of insanely high PPI). That can also be a downside if you have a hard time reading text without scaling. It's as if Dell thinks their monitors are going to be used outdoors in broad daylight. The upper brightness is driven by a combination of sharing parts with TVs (if you're farther away the optimum brightness is higher than for a monitor right in front if you), stats inflation (idiots who think bigger numbers are always better), and to make it look good in show rooms that typically have ambient lighting cranked to excessive levels (it supposedly helps hide the crappy nature of cheap panels). The high minimum brightness is because CCFL backlighting can only operate over a brightness range of about 2.5x, so the minimum is always ~40% of the max. I don't fully understand the measurements of dynamic contrast. It does seem to me that if they advertise a 10x advantage in contrast ratio with dynamic contrast on, and getting their figures from 2.5* the lowest brightness setting, that the lowest black level is 10/2.5x less than it is without dynamic contrast and with minimum brightness. Unless there is some additional way to cheating on the figures?